RollerTrol™ Skylight and Window Openers: Our window and skylight openers are very unobtrusive, blending well with your decor as there are no exposed rods or levers. The chain emerges at right angles from the housing to form a semi-rigid arm that will open a window or skylight. These units also work with our blind and shade motor remotes and automation systems. We have interfaces available for almost any type of automation protocol, not just our own preferred BroadLink® RF-IR blaster controller hub (with RF and IR learning capabilities). Turn all your old phones and tablets into powerful WiFi home automation controllers with the BroadLink® system! 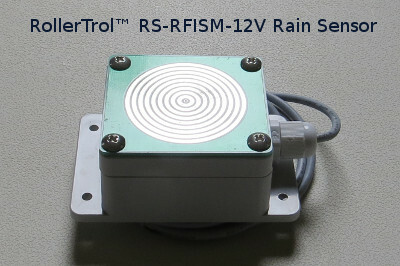 This is the third article in this series about creating an IFTTT rain sensor monitoring system for our motorized skylight openers. It is both affordable and able to control our motors directly, because it has the ability to "learn" individual RF motor control signals, including those used to open and close our skylight/window actuators. The BroadLink® alarm system is part of our automated hub solution, and it is being re-purposed by using a door/window open/close sensor as a digital input for the rain detector. 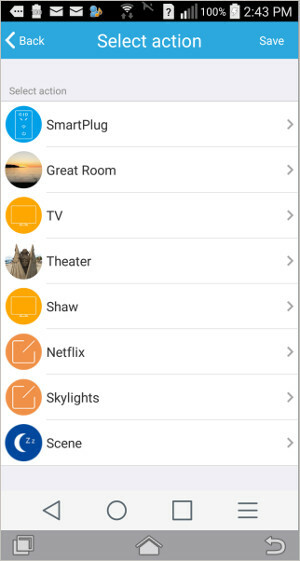 The hub phone app controls our skylight/window openers, blind motors, smart film, drapery motors, and many other devices, such as fans and LED lights. If you missed the previous article about the inclusion of the rain sensor component, please consider reviewing that article first. 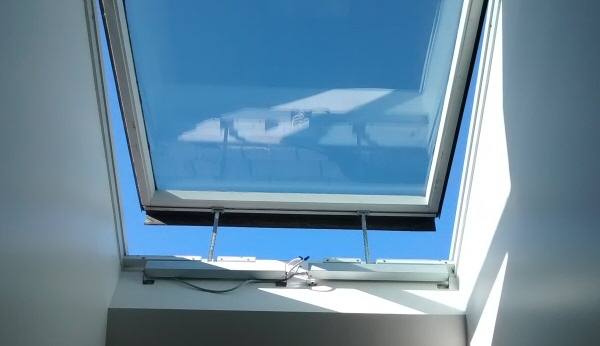 In this article we will be discussing the software that generates the IFTTT (if-this-then-that) event manager for the rain sensing system applied to a typical example of a motorized skylight opener, such as the units you see in the picture above. The picture to the right is a screen capture of the BroadLink® Android phone app (IOS is also available). 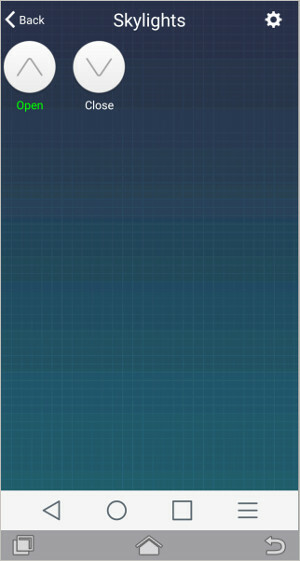 This is the master home screen for the entire system, where we have created control screens and installed various devices, including the last device icon that says "Rain Detect". 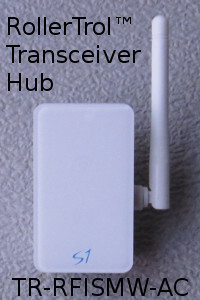 The very last item (Rain Detect) on the home screen is the icon that appears when you connect the TR-RFISMW-AC alarm transceiver hub (pictured at left) to your wifi router. 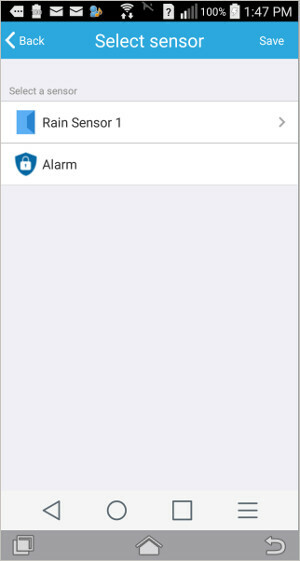 This alarm hub is the focus of this article series, managing the event logic and communications with the rest of the system via WiFi through your router. It also receives the digital trigger signals from the re-purposed door/window sensor that is connected to the rain sensor. 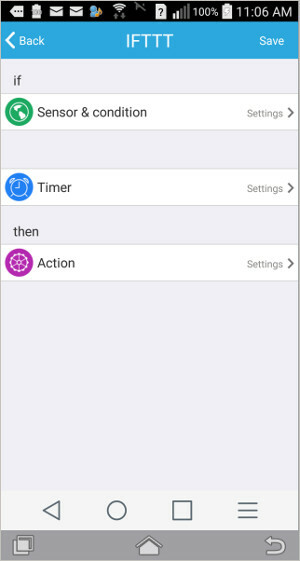 The hub contains the IFTTT alarm event reaction program, and it will automatically appear on any phones or tablets in your system that have had the BroadLink app installed. If you haven't already done it, please plug it into an outlet and connect to your router using the SmartConfig™ method; just enter your router SSID and password credentials. It will connect and retain those settings in non-volatile flash memory, so even if you have a power failure, it will automatically re-start when power is restored (as do all the units in this system). When you press the Rain Detect icon, you'll get the first screen on the left, below. 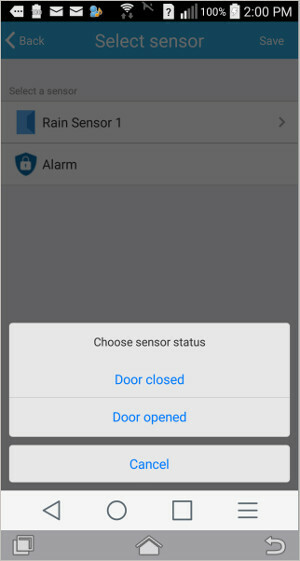 This is the status monitoring screen for your alarm system, and it will show you the current status of the door/window sensor that has been re-purposed as a rain sensor. Press the Interaction menu item and you'll get the second screen below, which is where we start the process of creating an IFTTT (if-this-then-that) event handler. 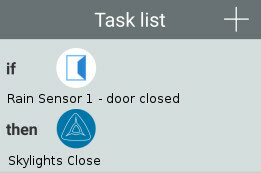 Press the Sensor and Condition option and the first screen below will appear. The name that appears will be the default name of the door/window sensor and you can change it to Rain Sensor 1 (or whatever you want) later. Do not press the 'Alarm' choice, that is for an entirely different function. 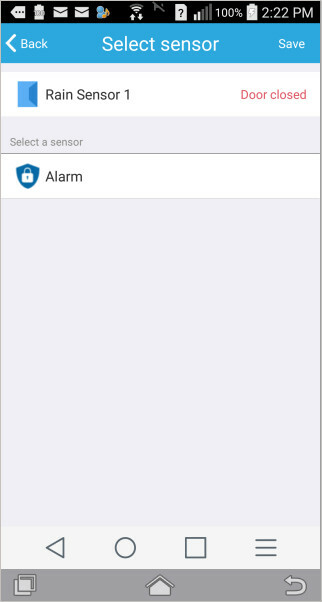 When you press the sensor selector (not the alarm) that is seen in the first screen below, the next "condition selector" screen will appear, as seen in the second picture below. Keep in mind this is the first of two events we are setting up for the re-purposed door/window sensor, one for "door closed" (rain start) and one for "door open" (rain stop). Choose "door closed" in this case. 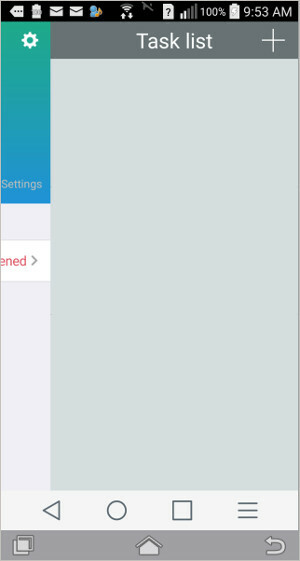 After you choose the sensor condition, you will be returned to the third screen, with the opportunity to save these settings, so it's a good idea to do that at this point. You can always delete an event later, if required. After saving the setup so far, pressing the "Back" button will take you to the saved list of sensors, and pressing the one we are working on will bring up the action screen again, as seen in the first picture below. We will skip the timer function, but suffice to say there is a lot of flexibility that can be introduced with that, such as delays, duration, daily repeatability, etc. 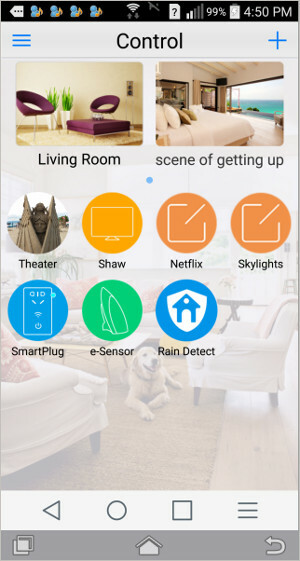 Pressing the "Action" button will set us up with a link to the various remote control capabilities that have already been set up on your system (see second picture below), one of those being the motor control system that opens and closes the skylight. Please Note: If you didn't see the previous article series about using our HA-RFIRW-5V controller hub for home theater, you may be interested to review that series as this IFTTT rain sensor is an add-on to that system. The previous series explains how to "learn" remote control signals for your motorized blinds, shades, and skylight/window openers. Following on, when you press the skylight remote selector (in second picture below), you'll see the actual action button that you normally press to manually close the motorized skylights (third screen below). Push that button and you'll complete the assignment of that action to the event. It is quite a simple process once you have done it a few times. 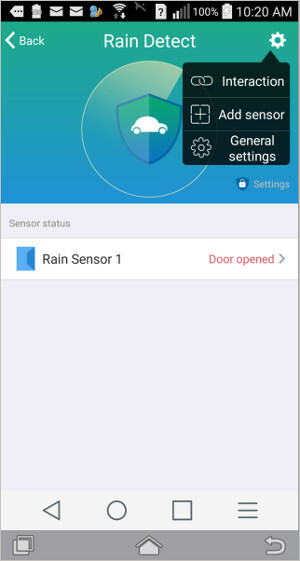 Please keep in mind that we are re-purposing the door/window opening sensor as an input device for the rain sensor. Your task list should look something like this picture. If you missed the previous articles about the re-purposing the door/window sensor as an input, you can see the first article here. If you followed along and reached this point with your installation, you should be able to return to the status monitoring screen and put a single drop of water on the metal detector plate of the rain sensor and see your skylight(s) close. To finish the event programming, you would now repeat the entire event configuration to handle the rain stopped event. The only difference will be the condition selector (door open event) and the action selector (skylights open). You may also prefer to raise a notification instead of actually opening the skylights right away; the options are many, and you can decide what works best in your particular situation. Set up a power interruptor that will prevent accidental over-ride of the skylight opening during rainfall. You could do this with our remote control relay module that can be programmed into the system. You might want to use an external "normally-closed" relay as our modules are "normally open"; this would save energy and prevent relay coil failure because neither relay would be powered on unless it is raining. Set up a second door/window sensor to make sure the skylight has actually closed; this would protect you in case the motor itself fails. You could also use a separate transceiver hub that would make the system completely redundant; they are not expensive..
You can also see more info about our motorized skylight/window actuators here.